CalCannabis Cultivation License Bond (CalCannabis ~ Dept. of Food & Agriculture Cannabis Cultivation Bond) • Surety One, Inc. Select this option if your business is applying for a state license for commercial cannabis activity involving medicinal cannabis. Medicinal cannabis refers to cannabis intended to be sold for use pursuant to the Compassionate Use Act of 1996 (Proposition 215) found at section 11362.5 of the Health and Safety Code by a medicinal cannabis patient in California who possesses a physician's recommendation. Select this option if your business is applying for a state license for cannabis intended for use by adults 21 years of age and over and who do not possess a physician's recommendation. There are eighteen different license classes which fall within these permit uses. You may review them listed on the cannabis cultivation temporary permit application here. A full description the same can be found in the licensing statute, CHAPTER 6. Licensed Cultivation Sites 26061. Both permit categories and ALL license classes require from an applicant a CalCannabis cultivation license bond. Per CalCannabis, an applicant for a cultivation license must provide, "Evidence of having obtained a surety bond in the amount of not less than $5,000, payable to the Department of Food & Agriculture. A surety is a way to ensure payment for the cost of destroying cannabis product, when such destruction is necessitated by a violation of the Medicinal and Adult-Use Cannabis Regulation and Safety Act (MAUCRSA) or Title 3, Division 8, Chapter 1 of the California Code of Regulations." The CalCannabis cultivation surety bond must be issued by a corporate surety authorized to conduct business in the States of California. The surety bond is a compliance obligation (license & permit) however it serves as a sort of "decommissioning" guarantee. Per the bond form, "WHEREAS, the provisions of the California Business and Professions Code section 26051.5 and California Code of Regulations, Title 17, section 40129, require that the Principal post a bond to cover the costs of destruction of cannabis or cannabis products if necessitated by a violation of the requirements in the Medicinal and Adult-Use Cannabis Regulation and Safety Act (MAUCRSA), contained in Division 10 of the California Business and Professions Code (§State of California Department of Public Health 26000 et seq. ), or regulations adopted thereunder, . 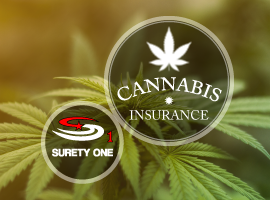 . . "
California surety bond leader, SuretyOne.com is the premier underwriter of the surety bonds needed by both the recreational and medical marijuana sectors. We firmly believe in supporting the availability of cannabis products to patients that benefit from them and will provide bonding to ethical cultivators of marijuana where state law permits. We will consider applications for a CalCannabis cultivation license bond for start-up businesses and cooperatives regardless of credit or financial statement condition. For further information contact us at (800) 373-2804 or email Underwriting@SuretyOne.com.